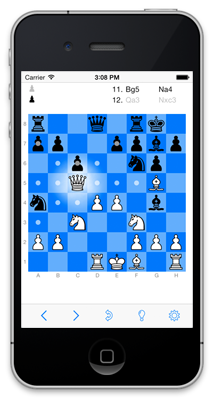 tChess's opening database contains the most common 15,000 opening moves from over 125,000 Grandmaster games. You can access this feature by going to the Features tab of the main menu. If you're using an iPhone, you can access it faster by swiping to the left on the board. If you're using an iPad, you can go to the Interface tab of the main menu and turn on the "Book toolbar button" option. The opening codes and names (e.g., "C60" and "Spanish" in the screen shot above) are from the Encyclopedia of Chess Openings (ECO) and are commonly used to refer to and research openings. 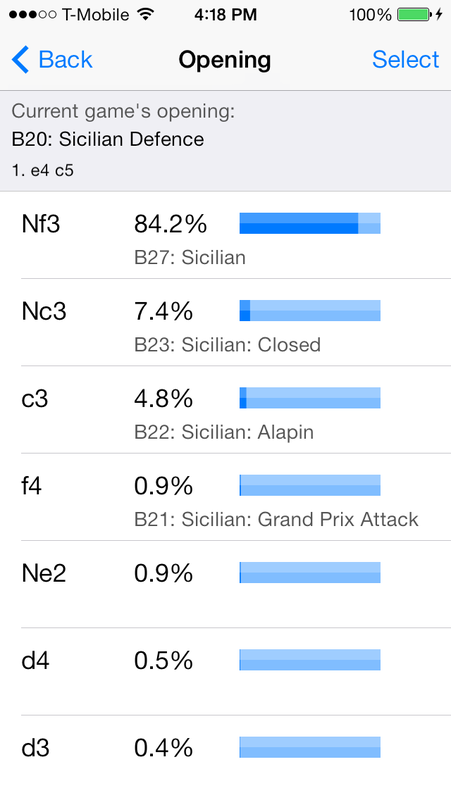 Question: What are the percentages displayed next to each move? The percentages show how often each move was played from the current position, based on the collection of 125,000 Grandmaster games. Question: Why don't the percentages always total 100%? 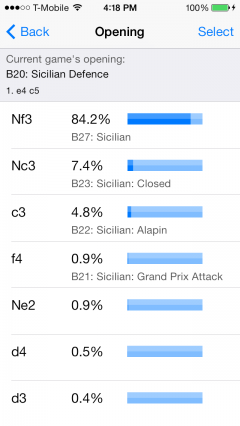 If the percentages don't total 100%, it indicates that other moves are played from the position, but aren't common enough to be included in the opening database. Question: Why are some moves displayed without ECO codes/names? It means the moves are frequently played by Grandmasters but aren't part of a main ECO line. They may still be discussed in the encyclopedia, though. Question: Why are there multiple openings with the same name? The ECO codes are used as an index into the Encyclopedia of Chess Openings. Some openings (or families of openings) warrant enough analysis that they require multiple ECO codes. Question: What if I want an opening library with more than 15,000 moves?